Bayer Leverkusen versus Schalke: the clock is ticking, the time almost upon us. The wait for one of this season's most highly anticipated match-ups is coming to an end and as we edge closer to a colossal clash of immense proportions, we pit the game's likely protagonists against each other to predict who will come out on top. If ever there was a match-up made in Bundesliga heaven, then this is it. How the wings will sing with operatic magnificence when these two go head to head to the delight of the BayArena. Both boast a combined ten assists in this season's top division, and each will be determined to add to that number once the first whistle sounds to get us underway on Sunday. But it's not just ferocious pace and those dribbling delights that Leon Bailey and Daniel Caligiuri are famed for, the pair also bring goals. The Jamaican speedster - who is ten years his counterpart's junior - holds a clear advantage in that stat section, the 20-year-old's nine strikes dwarfing the Schalke man's three to date this season. However, as the Italian born Caligiuri put it, "I'm no slouch." Indeed, the ex-Freiburg and Wolfsburg man added, "I've taken it upon myself to be more of a threat going forward." Yet Bailey knows that this encounter is, "Crucial," adding that he has, "full confidence," in Die Werkself's ability to take maximum spoils, and Schalke beware a confident Bailey. bundesliga.com verdict: Every little thing’s gonna be alright for B04’s Bob Marley fan. Watch: All Leon Bailey's goals and assists this season! Just when you thought this game was sufficiently well served with fine footballing tricksters in dribbling specialists Bailey and Caligiuri, the spectrum widens again with Julian Brandt and Leon Goretzka as part of the production. Brandt, the baby-faced, fair-haired, on-field assassin capable of that eye-of-a-needle pass and a terrifying turn of pace. The Germany international has revelled in Leverkusen’s counter-attacking flow this term, firing in four goals and setting up the same amount for his ever-grateful teammates. Yet if anyone is capable of upstaging the Bremen-born Brandt, it’s his fellow FIFA Confederations Cup winning teammate Goretzka, the Schalke man with the golden feet. How can a player so powerfully built be as nimble as King Leon? A scheduled summer transfer to Bayern Munich has failed to unfocus the famous son of Bochum, who continues to toil in the Miners’ engine room while seeking chinks of light in which to burst through. The 23-year-old may have one assist fewer to his name than Brandt, but matches the Werkself wizard in terms of goals scored this term. bundesliga.com verdict: Nothing can separate these sultans of skill. What a match-up this promises to be! A 35-year-old Brazilian playing as if in the prime of his career and a goal-hungry striker so close to cementing his best-ever Bundesliga campaign with a personal high of top-flight goals. Kevin Volland has ten to date, one shy of his previous best with Hoffenheim in 2013/14. Astonishingly, Schalke's rock in central defence, Naldo, has scored five, his goals saving the Royal Blues on more than one occasion. Volland's desire to find the net against Die Knappen will be heightened by the fact that his next Bundesliga goal will be his 50th while an outside chance of a spot in Germany's FIFA World Cup squad is still a distinct possibility. Yet Naldo, too, is dreaming of Russia and a call up with Brazil and after 23 consistent Bundesliga displays in the heart of the Royal Blues’ defence, it would surprise nobody to see the former Werder Bremen and Wolfsburg giant kitting out for the Seleção this summer. Having won 73 per cent of his challenges to date and scoring more Bundesliga goals than any other defender in the league, it would take a striker in red hot form to knock Naldo out of his stride. bundesliga.com verdict: None shall pass Naldo. Vastly different backgrounds, but one thing in common: both coaches arrived at the helm of their respective clubs at the beginning of the season as big gambles, neither having previously coached in the Bundesliga. A striker who at times hit monumental highs, Heiko Herrlich once finished as the Bundesliga's joint top scorer while at Borussia Mönchengladbach and was a German top-flight champion and UEFA Champions League winner with Borussia Dortmund. The Italian-born Domenico Tedesco had no playing career to speak of, but what he lacked in on-field experience, he gained in his furious study of the game and his coaching experience at youth level at Stuttgart and Hoffenheim. His studies led to him topping his class at a DFB coaching academy in 2016 before he took up the reins at second-tier Erzgebirge Aue. Despite the age difference of 24 years between the tacticians, they will share a firm handshake prior to their teams' meeting at the BayArena, each confident they have the tactical nous to outwit the other. Remarkably, both men oversaw three losses in their teams' opening six Bundesliga games this season, but from there it was lift off. Die Werkself - boasting an array of well-drilled attacking stars - went 12 games unbeaten at one stage, just one more than a similar sequence Schalke managed under Tedesco's wonderfully oiled machine. bundesliga.com verdict: Honours even, this time. 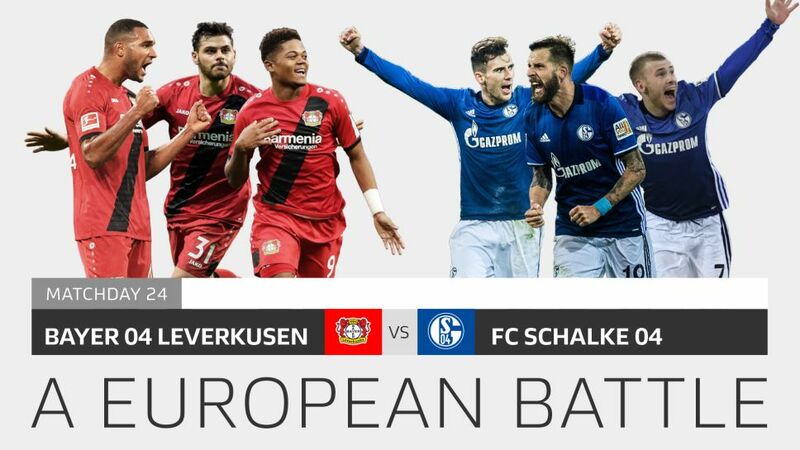 Click here for the Leverkusen vs. Schalke match centre!